Caution: All items should be installed by a qualified mechanic. 1. 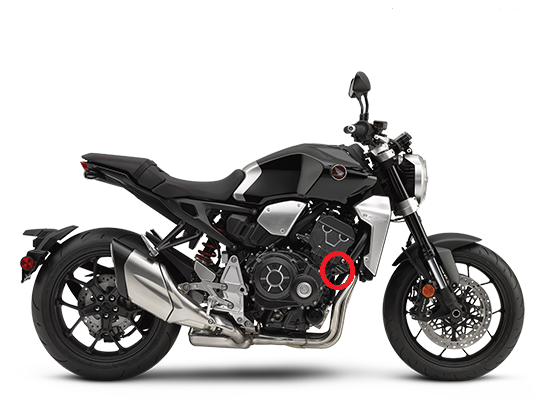 Start on the right side by loosening most of the way (do not fully remove) the engine mount screw circled in red with a 14mm socket and ratchet. 2. Apply a small amount of oil or grease to the supplied screw of the right side frame slider (short) and put the screw into the slider. 4. Torque the screw to 38 lb/ft if using a torque wrench. ​5. Repeat the same steps for the left side using the longest slider in the kit. 1. Apply red thread locker to the screw of the fork slider with the long base and tighten to the rod. 2. Insert the rod and slider through the right side of the axle. 3. Apply blue thread locker to the screw of the left fork slider and attach to the slider to the left side. 4. Hold the right side slider with a 5mm hex key while tightening the left side. 5. Use light torque- too much torque can damage the threads of the rod or break the screw. 6. Make sure the assembly does not have any lateral movement. ​For questions regarding installation, please contact us.